The MLB Winter Meetings came to a close on Thursday, but not before an intriguing three-team trade was pulled off to help conclude the week. As part of the deal, the Cleveland Indians have re-acquired longtime slugger Carlos Santana and first base prospect Jake Bauers. As part of the deal, the Seattle Mariners are receiving Edwin Encarnacion, as well as the 77th overall pick in next year’s draft from Cleveland. Finally, the Tampa Bay Rays receive third baseman Yandy Diaz and minor league pitcher Cole Sulser. One year after Santana signed a free agent deal with the Phillies, he’s on his way back to Cleveland. Philadelphia traded Santana to Seattle earlier this offseason, although the Mariners always planned on flipping him. Santana’s 2018 season was a little disappointing. However, he remains a power threat and should be welcomed back to Cleveland with open arms. In many ways, Bauers is a left-handed version of Santana. He hit just .201 in his first big league season in 2018 but also provided the Rays with 11 home runs and 22 doubles in 96 games. 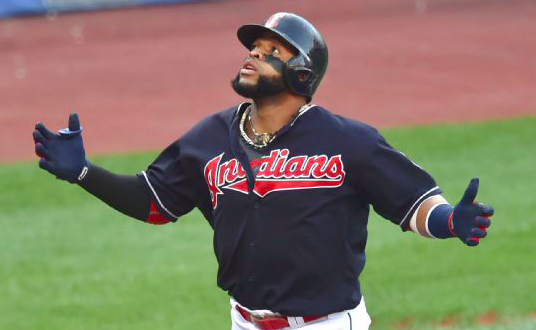 He can play either first base, a position currently filled by Yonder Alonso, as well as the corner outfield, where the Indians could use some help. Meanwhile, the Indians may have to shift Santana to third base after trading away Diaz. Speaking of Diaz, he’s a third baseman by trade but may be moved to first base with Matt Duffy entrenched there in Tampa Bay. Despite a limited number of at-bats in the big leagues, the Rays appear high on Diaz’s bat. In just 265 at-bats in Cleveland over the past two years, Diaz hit .283 with an OPS of .727. As for the Mariners, they appear willing to flip Encarnacion if they can find a taker. A rebuilding club like Seattle has little use for a player with $25 million in guaranteed money left on his contract, including a $5 million buyout for the 2020 season. If the Mariners decide to keep him, Encarnacion would essentially replace Nelson Cruz as the team’s primary DH. Ultimately, this trade moves the needle for all three teams for their various goals. The Indians save some money in the short-term by swapping out Encarnacion and Diaz for Santana and Bauers. The Rays added a versatile and promising young infielder in Diaz. Finally, the Mariners successfully slipped Santana while also gaining an extra draft pick to help them rebuild.